Exploring advanced trails through hiking or biking during the spring season is a great way to enjoy an inspiring outdoor adventure in Branson along with fantastic sightseeing of many spectacular sceneries. Hiking in Branson’s advanced trails is one of the most exciting outdoor adventures that will let you see the spectacular first bloom of flowers and plants around the picturesque Ozark Mountains. This season many hiking enthusiasts want to experience a fascinating spring hike at some great hiking trails that are listed below. Table Rock State Park is one of the 80 state parks in Missouri that draws thousands of visitors year round. The park offers excellent trails perfect for hiking, biking, and horseback riding. At Table Rock State Park, you will find it fantastic to enjoy the relaxing atmosphere that you can feel under the shades of the trees on the well-guarded and well-maintained campgrounds. You will find it also exciting to saunter on the lakeside where you will feast on many spectacular sceneries. The park is one of the best vacation destinations in the Midwest where you will find it great to enjoy a fascinating outdoor adventure in Branson. Around the park, you’re sure to find many fantastic water sports activities such as water skiing, tubing, boating, and many other thrilling water fun adventures. The2.25 miles long Table Rock Lakeshore Trail is another beautiful hiking trail in Branson that connects to the Dewey Short Visitor Center. The path offers some activity options and is best to enjoy fantastic hiking experience from March until October. The trail is wheelchair accessible and also allows dogs to use the trail but must be kept on the leash. You can expect to spot various wildlife along the route with chances of spotting deer, red tail boxes, chipmunks, squirrels, osprey, bald eagles, cardinals, ducks, bluebirds, and other species. Lakeshore Trail is separated by the lake anywhere from 15-40 yards of trees. Many scenic views of the lake are sporadic depending on the season, but when the weather is good, you’ll find it spectacular. There are also dry woodlands and beautiful glades on the upper side of the trail where you can spot oak trees more than 200 years old. The Bull Shoals Lake Hiking Trail which is located around the Bull Shoals State Park in Branson is another beautiful trail that offers a unique hiking trail. The 3-mile trail offers a fantastic hike experience which is rated moderately difficult. There are other two hiking trails at Bull Shoals State Park that include Big Bluff Trail and Lakeside Trail. The 1.5 miles long Big Bluff Trail is the one overlooking the White River below the Bull Shoals Dam which is rated as easy. 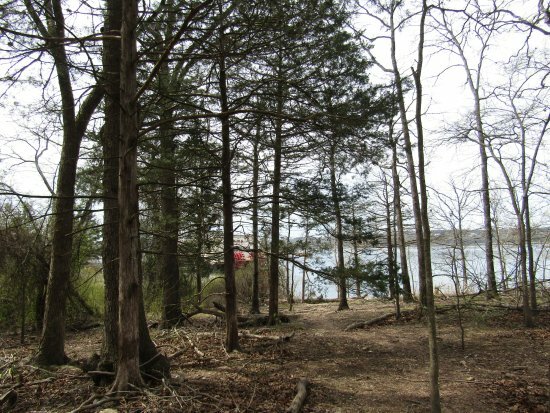 The Lakeside Trail is the other trail that spans only 1 mile along the shore of Bull Shoals Lake and is ranked as easy. Dogwood Canyon Nature Park has an area of 6 miles of flat land which is perfect for hiking, mountain biking, and horseback riding. You will find around the park limestone bluffs and tumbling waterfalls. As you enjoy a fantastic hiking experience in the park, you can have the chance to see a variety of native wildlife species. Along the lakefront of Taneycomo, you will find the Branson Landing Riverwalk that also offers a fascinating hike on a paved trail. This trail is only one and a half mile long. But this short paved trail is where you can see the vibrant town square where the $7.5 million spectacular fountain show is located. Busiek State Forest and Wildlife Conservation Area is an extensive hiking trail that covers an area of 2,505 acres of forested areas and rocky hills. The State Forest is divided into two trail systems. The first one is the east trail system that stretches 10 miles, and the other is the west trail system that extends 8 miles. 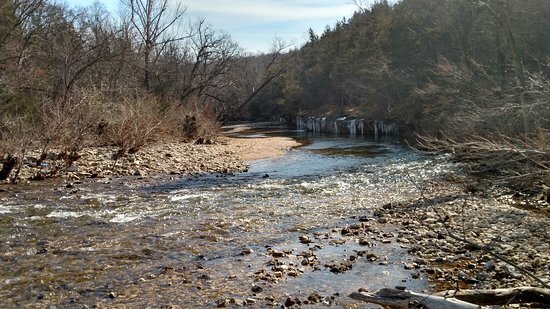 The Ruth and Paul Henning Conservation Area which is located in the White River Hills on the west side of Branson has an area of 1,543 acres of wooded forests, hillsides, streams, and a series of valleys. The valleys in the area are sometimes referred to as balds which make up the historical White River Balds Natural Area where vigilantes used to group after the Civil War. If you have visited Branson many times, you probably have heard “baldknobbers,” where its name derived from this plot of land. The Ruth and Paul Henning Conservation Area is home to five hiking trails that include Dewey Bald, Glade Exploration, Streamside, Shane’s Shortcut, and Homesteaders. The Dewey Bald Trail can easily be spotted upon reaching the conservation area, just off Highway 76. This is one of the first trails that hikers easily see. It is only about 0.4 miles in length, although it is a paved path, this is an uphill trail that leads to a 40-foot observation tower, providing visitors a panoramic view of the beautiful landscape of Branson. Next, to Dewey Bald Trail, you will find the Glade Exploration Trail where you can enjoy a comfortable and moderate hike. This trail is mostly forested with a few scenic glades and picturesque view of natural sceneries. The Glade Exploration Trail is about 1.1 miles only but if you pass by all the loops and the adjoining Homesteader’s Trail the total length could reach 6 miles. The Streamside Trail which is only about 0.4 mile in length offers a comfortable and moderate trail to hike. The Shane’s Shortcut Trail which also stretches 0.4 miles, is a bit more difficult to hike. This trail connects to Streamside Trail and Homesteader’s Trail. The longest of all the five trails and one of the most challenging trails to hike is the Homesteader’s Trail which is 3.4 miles long with a hiking time of 3 hours. Many visitors want to experience great outdoor adventure in Branson during spring because this is a time where you will find it fascinating to take a hike at some of the challenging trails in this favorite vacation spot in the Ozarks.